And the moment of pure joy. There are moments. Simple, perfect, magical moments, moments you know are fleeting but will live on as treasured memories. Sometimes they sneak up on you, like the moment when Dean Cain and Teri Hatcher stepped through the doors of the Daily Planet to greet us back in ’95. Some you get to see coming. In the Heracles tour of 2004, when we reached Edmonton we started playing to full houses, which meant that the curtain call would involve about 100 people cheering for something I wrote, directed, and had just starred in, and man I devoured that rush each time. That’s all you can do, really. Live in that moment as hard as you can. Drink in every detail. Savour every second of this perfect moment you’re given, for time’s arrow moves ever forward. No I’m not done with BoJack Horseman references. No I’m not going to explain my BoJack Horseman references. It’s all on Netflix, you only think you have better things to do. When we last left off, I was on my way to the Warner Bros. Studio, home of great memories from LAFF ’95 and ’96. There was no chance this tour was going to live up to my previous tours. I knew that. Obviously I knew that. 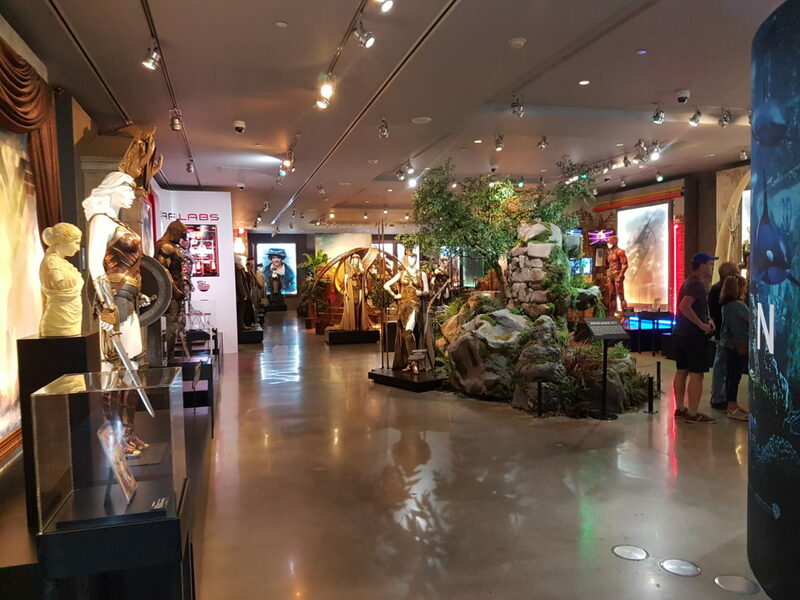 I wasn’t here with dozens of like-minded fans, something that was made clear to me when our guide polled our group as to what WB shows we enjoyed. “Who here likes Friends?” he asked us, receiving a round of applause and cheers. “Gilmore Girls?” Less applause but not none. “Big Bang Theory?” enough applause my eyes rolled. And then the one I’d been waiting for. But I could hope. Hey, I follow Lucifer’s Aimee Garcia on Instagram, they run into tours sometimes, and season four was mid-filming when I was there. 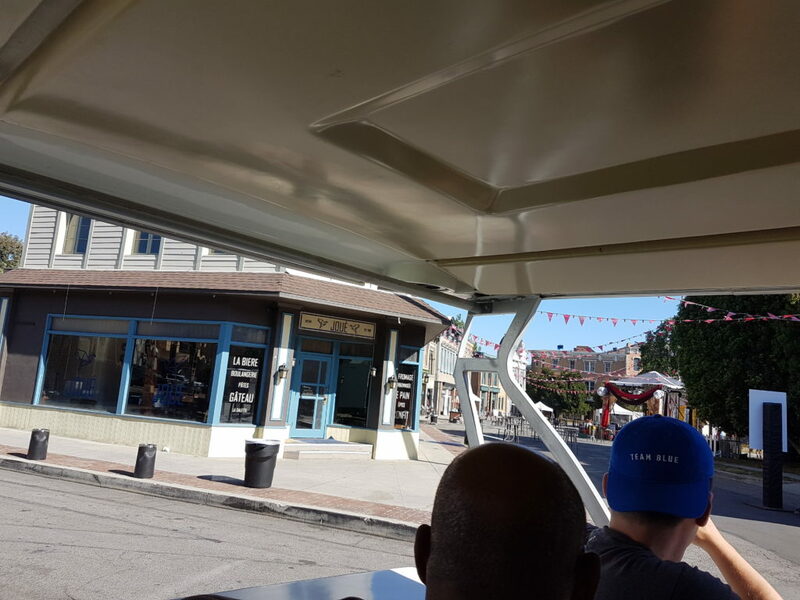 It did not, however, take us long to reach what was once known as Stars Hollow, home of the Gilmore Girls. Luke’s Diner no more, as another show has taken it over, but I’d know that town square any day. We saw the strip of grass, about ten or fifteen feet long, backed by trees, that doubled for Central Park anytime the Friends headed that way. Visiting Central Park itself a couple of weeks later, I did not spot much similarity, but hey, the illsion works. Back in the 90s, I was on a very famous as the tour kicked off, the costumes for Batman Forever were proudly displayed. And I remember thinking “Wow but Robin’s codpiece looks bigger than it could possibly need to be.” This style of costume showcase has only expanded since then, as our tour stopped by a two-story reliquary, which I thought of as The Hall of Franchises Warner Bros is Choosing to Remain Proud Of, Despite Some Diminishing Returns on Recent Entries. In other words, the DCEU and The Wizarding World of Harry Potter/Fantastic Beasts. 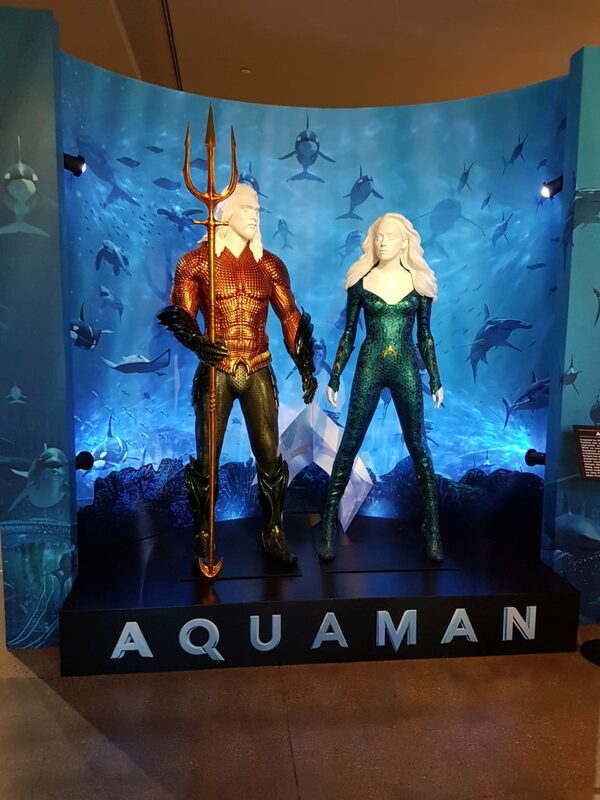 Yes, fine, Justice League underperformed, and 2 Fantastic 2 Beasts was a pile of world-building in search of a plot, but it was still super (sorry) neat to see all of the costumes and props from the DC and Wizarding World movies… also two costumes from an upcoming entry that might… MIGHT… not let me down. Come on, guys, you can do this. Don’t let this burst of optimism age badly. I did not bother getting a photo of Cyborg’s “costume” from Justice League. That was not anybody’s costume. Ray Fisher wore a motion capture bodysuit and we all know it. 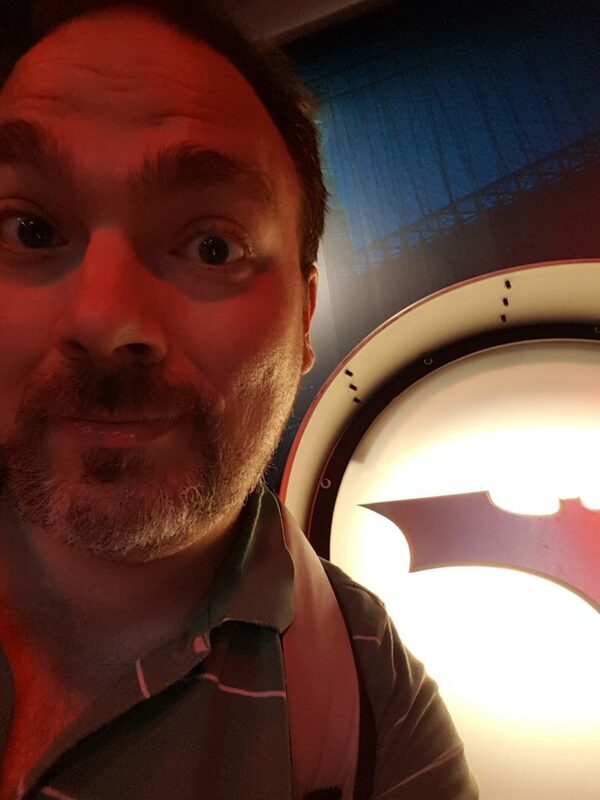 We also saw the Hall of Batmobiles, where I got to switch on the Bat-Signal. It’s not “Flying the Tardis” awesome but it sufficed. All of this was fun and cool and put a smile on my face. But it wasn’t The Moment. In between Franchise Hall and the Batmobile Garage, we pulled over. Our guide was going to try to get us into a sound stage. 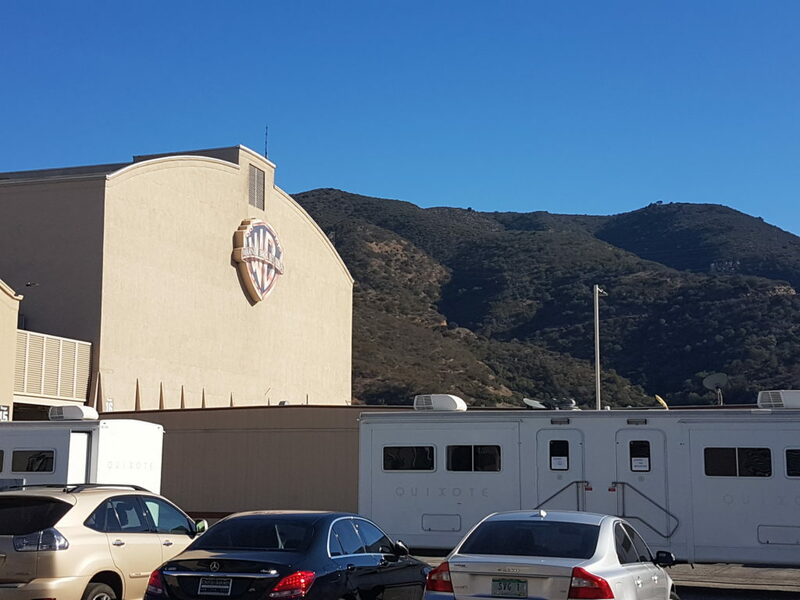 Not just any sound stage, but Stage 16, the tallest on the lot, one of the tallest in the world. So that’s neat. He made no mention of what was in it. A chant began in the back of my head. A focus of will, of hope, a plea to a universe that normally turns a deaf ear to my requests. As our guide confirmed that Stage 16 was good for a visit, I tried to brace myself for disappointment. It could be anything. Not Mom or… whichever reality show films at the WB, we passed those stages earlier. But it could be something from The Big Bang Theory, or All American, the only CW show I can think of that doesn’t film in Vancouver. That one certainly came up a lot. In fact the only cast member we saw on the tour was from All American, or so I assume, because even with the Halloween event taking over chunks of the lot there can’t be that many reasons someone would walk from a sound stage to a trailer dressed as a cheerleader. I don’t know who it was. Don’t ask me. I don’t watch All American, I couldn’t pick the non-Taye Diggs cast members out of a lineup. Anyway. While the guide explained the rules… absolutely positively no photography of any kind, if we’re caught taking pictures they’ll all but factory reset the phone to delete the photo… I kept telling myself not to get excited, and just appreciate wherever we end up. As much as possible. I do not care about All American. We stepped through the door. My eyes adjusted to the light. Didn’t even need to see the sign at first. I’d know that bartop anywhere. And those couches. And that balcony. The sign just confirmed everything, erased all doubt. I didn’t take this. The rules were clear. In fact I was on the other side of the room from here. I responded with all of the calm and poise of Buddy from Elf being told Santa was coming out. “Lux. This is Lux. 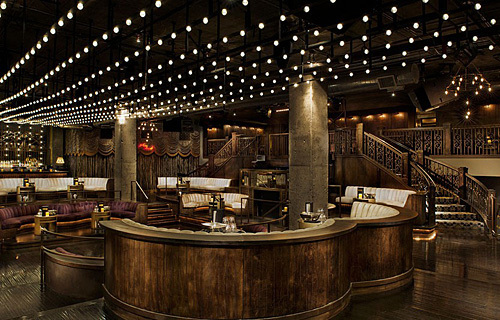 We’re in Lux.” I was beaming as I surveyed the room, drinking in every detail. The guide described the filming process, how each scene is shot repeatedly from each angle, but I was just… being here. Being present. Savouring every second that I was in Lucifer’s nightclub, the room where Lucifer met Chloe, the very spot where Cain and Amenadiel fought, right near the spot where Lucifer caught his mother dancing on a table. You live in the moment as hard as you can, for as long as it lasts. I did the only thing that made sense. I am… very grateful no cast member was anywhere nearby, because we shouldn’t be assuming that my “best” Tom Ellis impression was, you know… good in some way. 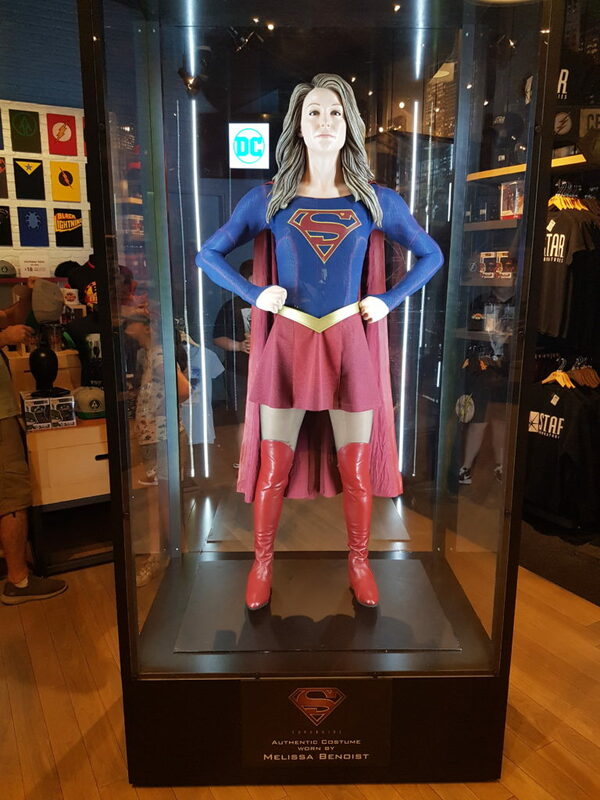 Even the gift shop has CW superhero costumes on display. But it was hard to top those few minutes in Lux. Good day. Great day. Not even those mixtape pushers or the long drive back to Anaheim could compromise it. I came for the nostalgia, but I received a gift. Of course, this wouldn’t be the only thing I did that week inspired by a TV show I watched. We’ll discuss the other two next time. ← Return to LA: Hooray for Hollywoo(d)! You do seem to live the moment. I’m impressed. Maybe I should watch Lucifer! The fourth season hits Netflix early next year, it’s possible the first three will come with it.